The Chocolate Bar palette comes prettily boxed up just like chocolates, and the actual bar itself is shaped like a chunky bar of the milky stuff. 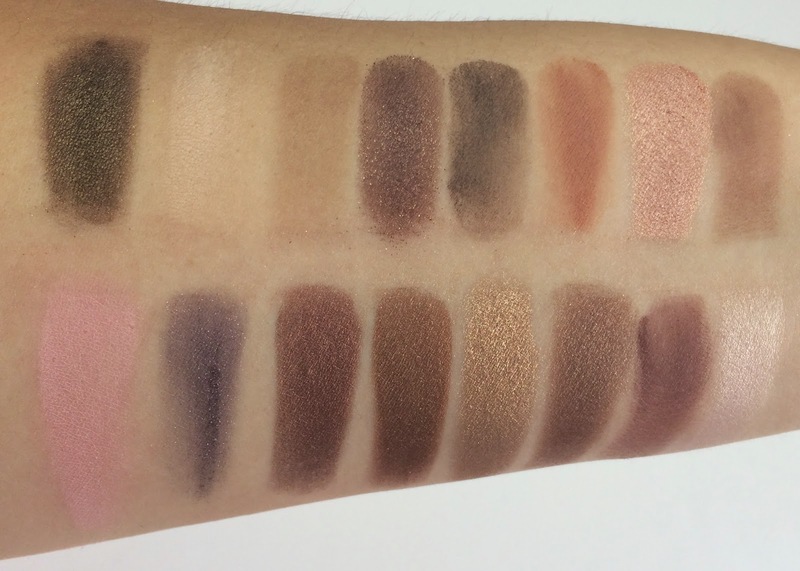 I don't have the earlier version for comparison, but apparently the palette was originally a bit chunkier, and now they've made it slimmer - it seems a very normal size to me - probably a bit thinner than a Naked palette. And when you open it up, well that's even more exciting to me than if it actually had chocolate inside! I love the colours in this palette - I think I'd describe them as exciting neutrals :) There's a real mix of textures too, satins, mattes and shimmery shades. I've swatched all of the colours in the order they come in the palette - I've gone left to right from the top to the bottom. I love that there's an unexpected pink (Strawberry Bon Bon) and purple (Candied Violet) in the palette. I also really like the shades Marzipan and Hazlenut, but they're all really beautiful colours. Other than the palest shades, which are a little bit less pigmented, all of the shadows are really easy to work with - they're really soft and blendable and give great results. Now I'm not the best at smoky eyes - I'd say I used to be the worst, but I've been really trying to get better! This palette was just crying out to me to be used in some more complicated look combinations, so I thought I'd give it a go and share with you how things turned out. Why is taking photos of eye makeup so difficult?! This was my first attempt with the palette, and I was drawn towards the pink and the purple. I started with Strawberry Bon Bon all over the lid and carefully blended Triple Fudge softly into the crease. I added Candied Violet on top in the outer v, added some more Strawberry Bob Bon to strengthen the colour and then finished up with a little Champagne Truffle in the inner corners. For this more bronzey look I started with White Chocolate on the lid and Milk Chocolate in and above the crease. In the centre of the lid I've gone for Crème Brulee and I darkened the crease with Semi-sweet and a teeny bit of Hazlenut. And lastly I wanted to get a bit shimmery with Marzipan. I've learnt that applying a shimmery or glittery shadow all over the eyes is a bit of a noob error and does me no favours at all, so I made sure to apply it last and just to the middle of my lids. I think I might have finally mastered it! As a base here I used Salted Caramel, I have Haute Chocolate and a little bit of Candied Violet (loving that shade) in the crease, and then Marzipan centre stage. Wonky liquid liner optional. I highly recommend this palette - there are just so many different looks that you can get from mixing and matching the colours - I think this will certainly be travelling to Mexico with me so that I can continue to practise my smoky eye skills before going out each night. 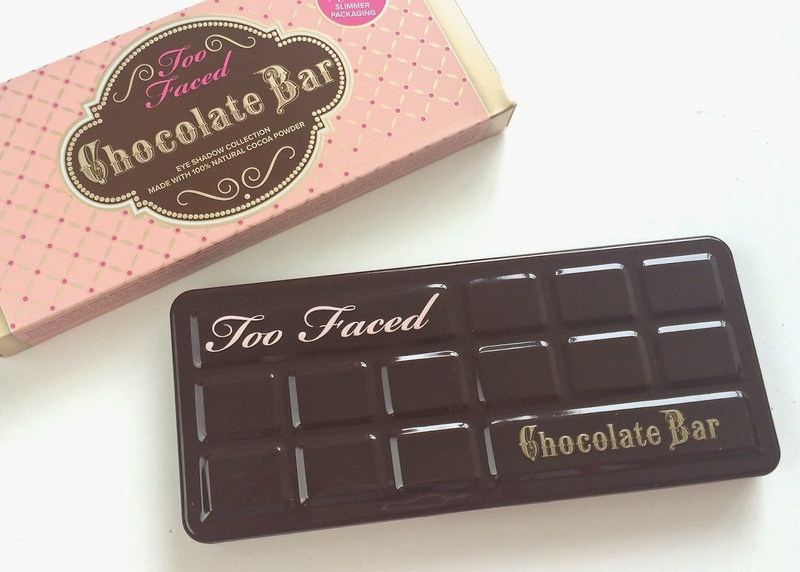 The Too Faced Chocolate Bar palette costs £45 from Debenhams, asos and Beautybay. I love a good swatch sesh! Beautiful! Love the second look you did!